Who are the best reporters on Twitter? I was part of the judging panel put together by Press Gazette editor Dominic Ponsford to vote for the best UK reporters on Twitter and other social media. It was a really interesting exercise — the long list came from reader suggestions — and made me aware of a number of journalists I hadn’t followed before. Among the was @AlexandraRucki, formerly with the Wandsworth Guardian and now an online journalist with the Evening Standard. She was beaten to the top spot by Peter Jukes, @peterjukes, who has done an excellent job covering the hacking trial. You can read the full list over on the Press Gazette site. Posted on April 9, 2014 April 9, 2014 Categories Social mediaTags Press Gazette, TwitterLeave a comment on Who are the best reporters on Twitter? Nine out of every ten visits to the Guardian website from tablet devices still come via an Apple iPad. This compares to 98 per cent two years ago and is despite the proliferation of Android-based alternatives since then (Google’s Nexus 7 and Amazon’s Kindle Fire are distant runners-up). That was just one of the figures provided by Anthony Sullivan, the paper’s group product manager for journalism products during last Thursday’s Press Gazette News on the Move conference. He also demonstrated how tablet usage was altering web consumption patterns across the weekday. 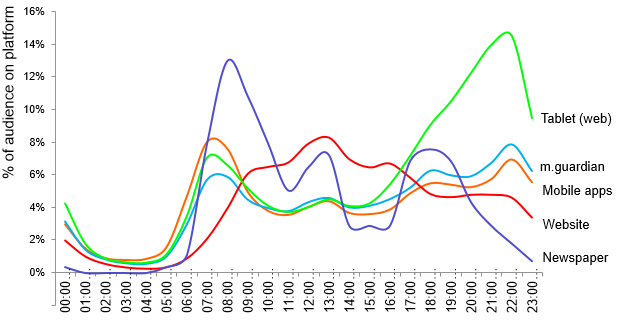 Note the large green peak in the graph below which shows heavy tablet usage during the evening. By cross-referencing the means of access (mobile network, WiFi, fixed network etc) the Guardian is able to make an educated guess that most of that tablet consumption is happening at home rather than on the move. How? Well, according to Sullivan, 93 per cent is coming via WiFi which strongly suggests sofa/kitchen table/bed rather than train/bus/office. Anthony intended to show this and four associated graphs during the session I ran at the conference but issues with the audio visual — familiar to any regular conference goer — meant he was restricted to describing what we couldn’t see. Belatedly, you can see all five graphs over on the Press Gazette. And you can watch the entirety of News on Move on this Google+ hangout. The panel session in question, starts at around 23 minutes and 50 seconds. Finally, it is worth revisiting the FT graph I posted last week which shows some really interesting weekend consumption patterns brought about by increased mobile device usage. Both trends are reflected on other news and current affairs websites. UPDATE: I was alerted to this analysis of tablet activity by the BBC based on access to the iPlayer. It was published a month ago but adds to the overall told above. There was a really smart piece of analysis by Jasper Jackson over on The Media Briefing yesterday where he looked at the impact of mobile device usage and how it affects “when consumers access your content”. His findings, based on data from the FT and the Guardian, mirror the experience of the New Statesman and the Press Gazette – specifically how heavy usage of smartphones and tablets at weekends is filling the deep Saturday and Sunday troughs previously typical of news-based websites. The FT graph also shows clearly the pre- and post-work ‘check-in’ via mobile devices during weekdays. A key point here is that the bulk of this traffic is additive – the FT is seeing high levels of traffic to its website during times when there was previously very little, simply because people now have a way of accessing it. Again that mirrors my own experience. We are starting to see a number of changes to the way editorial teams publish. Obviously having someone working nine-to-five on mobile publishing doesn’t work. And if you don’t have a weekend operation, perhaps now is the time to start. More over at The Media Briefing.